2066. Greenhouses with bonnet roofs were some of the first structures set aside exclusively for plants; and these are still to be met with in Poland, and some parts of the north of Germany. In a house of this kind (fig. 596. 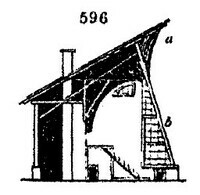 ), the roof (a) projects considerably over the steep glass front (b), and protects the glass from the hail. It also serves to protect the plants from perpendicular frosts, but it deprives them of a considerable portion of light and heat from the sun.